Its Bingo time for this month’s social get together in the Social Services on Wednesday 3rd. Please come along and join in the fun. Small cash prizes and raffle prizes to be won. Community Bus available for pick-ups. Please contact David on 086 8091506. Cover Charge €5. The death occurred peacefully on Thursday 13th September at her residence of Mary (May) Preston nee Bryce Ballyscanlon Crossmolina. Her remains reposed at Hineys Funeral home on Saturday evening. Requiem Mass on Sunday in St Tiernans Church with burial afterwards in Crossmolina cemetery. Mary was predeceased by her husband Jack is survived by her daughters Mary O Connor (Ballintubber), Angela Holland (Melbourne), Loretta Flynn (Killala), Teresa Sheehan (Craughwell), Bernie King (Castlebar), Helen Brogan (Glenamaddy) and son Thomas (Carrowkilleen), brothers Pat (Moygownagh) James and Martin (U.S.A.), sister, Sr Dominic (Castlebar), sons-in-law, daughter-in-law, grandchildren, great grandchildren, sisters –in – law, brothers – in – law, nieces, nephews, relatives, extended family, friends and neighbours. May she rest in peace. The death occurred peacefully on Saturday 15th September at the St Josephs District Hospital Ballina of Mick Gillispie Erris St Crossmolina and Formerly of Fiddaun Keenagh. His remains reposed at Hiney’s Funeral Home on Sunday evening with removal to St Tiernans Church. Requiem mass on Monday in the Church of the Holy Souls Keenagh with burial afterwards in Kilmurray Cemetery Mick was predeceased by his parents Edward and Ellen brother Edward is survived by his sister Bridgie Murray Shramore Newport, nephews Noel, Gerard and Eamon, nieces Rita and Breege, cousins, neighbours, extended family, many friends and work colleagues. May he rest in peace. Results from Crossmolina golf society outing in Westport on Sat 15 Sept. Over all winner Michael Herr. Cat 1 Conor Reilly. Cat 2 Johnny Leonard. Front 9 Patrick Fox. Back 9 Enda Jordan. Visitors prize Bernard McDermott. At the Executive meeting of the Crossmolina Deel-Rovers GAA Club on Tuesday night 11th September Votes of sympathy were expressed to the Family’s of the following who died recently. Mary Browne nee Foley The Moorings Ballina formerly of St Patricks Ave Crossmolina, Edward Gillispie Fiddaun Keenagh, Michael Hopkins Eskeragh, Ann. Marie Corduff Knockaphunta Park Westport Rd Castlebar formerly of Mullenmore Rd, Charlie Finnerty Ardvarnen Moygownagh, Joie O’Hora nee Maughan Rathnaconeen Ballina, Paddy McAndrew St Marys Park Crossmolina, Sarah Loftus nee Noone Cloughbrack Bofeenaun, Josie Moran Killala cousin of John Moran Lecarrow, Maureen Boland nee Anderson Moneymore Crossmolina, Willie Garrett Mullenmore Rd Crossmolina, Margaret Gallagher Knockmore mother of Martin Mullenmore Crossmolina, Lena Togher nee Wilson Drum Clogher Belmullet mother of Mary Gallagher Lecarrow, Margaret Donohue nee Loftus USA formerly of Dooleeg sister of John Loftus, Padraic Hopkins Ballina St formerly of Dooleeg, Owen Joseph Walker Castlefield Manor Ballina father of John North Mayo GAA Secretary, P.J. Cafferkey Fairfield husband of Margaret Duffy Erris St, Kathriona Clancy nee McHale Artane, Dublin formerly of Rathball Knochanillaun, Conor Dempsey Rathduff, Cloghans, Knockmore, Michael Jordan Kilkenny Cross Castlebar father of Toni of Sticks Bar Crossmolina. May they rest in peace. 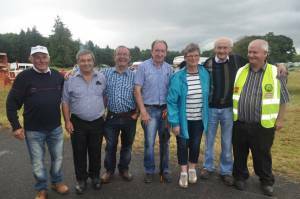 Enjoying the recent Enniscoe Heritage Day at Enniscoe House are from left Anthony Molloy, Stephen Gilroy, Kevin Connor, James Munnelly, Teresa Cuffe, Padraic Cuffe and Gerry McDonnell. Important Notice re Data Protection. The Parent & Toddler group takes place every Thursday from 10.30am to 12.00 noon in the centre. This group is open to all parents, Grandparents and childminders to come along with their child/children and meet new people over a cuppa and a chat. Various activities take place and new members are always welcome. Ring 096 75573 for more info. Wednesday 19th September 2pm – 4pm. It’s Bingo time for this month’s social get together in the Social Services on Wednesday 19th. Please come along and join in the fun. Small cash prizes and raffle prizes to be won. Community Bus available for pick-ups. Please call 096 30934 for details. Cover Charge €5. Crochet Classes in Ballina Family Resource Centre. Crochet classes for Adults take place on Wednesday 19th Sept. from 11.00 am to 1.00 pm. Ring 087 6956652 for more info. Beginners & Improvers are welcome. Please participate in the festival survey as plans are made for 2019, you can help shape future festivals so let us know what you think. The link for the survey is https://s.surveyplanet.com/BkAdx0zIm or you will find the link on the festival Facebook page and website, it only takes a few minutes and the survey closes on Sept. 15th. Thank you to everyone that has taken part so far. Many Thanks to all who contributed to Mayo Mental Health Association Church gate Collection in Crossmolina. €686. 62 was donated a sincere thanks also to the Collectors. Congratulations to Ailish Mulhern Cuilacurrane and Darren McDonagh Killala Rd Ballina who were married in Bonniconlon church recently with reception in Loughrynn Castle, Maresa Hanahoe Dublin daughter of Liam and Ursola Dublin and formerly of Carrowgarve and Edward Lynam Uk who were married in the Church of our Lady Kilmurray with reception in the Diamond Coast Hotel Enniscrone. Wishing both couples many years of good health and happiness from their many friends. A vacancy has arisen on the Moygownagh CE scheme working in Crossmolina. Suitable candidates please contact John or Ann on 096 31066. Do you want to have a role in a Hollywood film? We are looking for budding actors, producers, directors, location scouts, make-up artists, costume designers and more. . Come along to our Oskars Information night on Thursday Sept 6th at 8pm on Gortnor Abbey to find out more exciting details! Mayo Cancer Support Assoc. will run Relaxation with Aromatherapy, starting in Ballina Family Resource Centre on Tues Sept 11th 10.30am to 12.30pm. Please call 0872804164 if you are interested. Exercise for Women is Back!! Ballina FRC Exercise Classes for Women is Starting back next Wednesday morning 5th Sept from 11.00 am to 12.00 noon in Ballina Family Resource Centre, Ardnaree. The group enjoy a chat and catch-up over a cup of tea/coffee after the exercise. New members welcome. Ring 096 75573 for more info. Parent & Toddler Group is Back!! Ballina FRC Parent & Toddler Group is starting back on Thursday 6th Sept from 10.30am to 12.00 noon in the centre. This group is open to all parents, grandparents and childminders to come along with their child/children and meet new people over a cuppa and a chat. Various activities take place and new members are always welcome. Ring 096 75573 for more info. We are pleased to announce that Crossmolina No Name Club for teenagers will restart after the Summer break. Monday evening will be the designated time to meet and unless otherwise requested it will take place once a month. We are actively encouraging participation from the Crossmolina and surrounding area. Parents/Guardians can research information on No Name at www.nonameclub.ie We are also looking for Youth Leaders of all ages. There's a committed key group in place so Youth Leaders will be able to concentrate on supervision and facilitation. Please get in touch, contact 087 218 6560 for information. Social Inclusion Awareness Week takes place from 15-21 October 2018. The aim of the week is to support and organise initiatives throughout the county that foster inclusion, equality and social connectedness. It is an opportunity to celebrate the diversity of people in County Mayo, to showcase the work of your organisation and/ or to organise a special activity or event which promotes inclusion. Following on from the success of last year’s Social Inclusion Awareness Week where over 40 showcase events were held throughout the county, this year’s theme is ‘A Connected Mayo’. We are particularly interested in initiatives that explore community responses to social isolation and loneliness. Types of events and activities could include interesting speakers, exhibitions, coffee mornings, sports events, drama, story- telling, talks and debates, seminars, information events, displays, music recitals, initiatives to improve accessibility, films etc. (the list is not exhaustive). Bear in mind, in keeping with the theme, events should be accessible to all. A brochure of events is currently being compiled. If you would like to be included in the brochure please complete the attached booking form and return it to the Community and Integrated Development Section Mayo County Council (contact details listed on form) by September 5th 2018. Only free events can be included in this year’s brochure. Please submit a separate booking form if you plan to run more than one event. The up-to-date schedule, further information on events and booking details for all events will be available from mid-September.